idle wrote: if you want it complete like the author intended you need the icon set called: Paper Icon Set. Oh my, that is very nice, thank you! I click the link but Cinnamon Spices says the theme is not there. I have been looking for a transparent menu like that. Would someone please supply the code for adjusting transparency of the menu. The code supplied earlier in this thread does not work for me. Thanks. EDIT: oops, I see that is a very old post and have since found that transparent themes are already there in 18.3 Cinnamon. They are from Cinnamox. 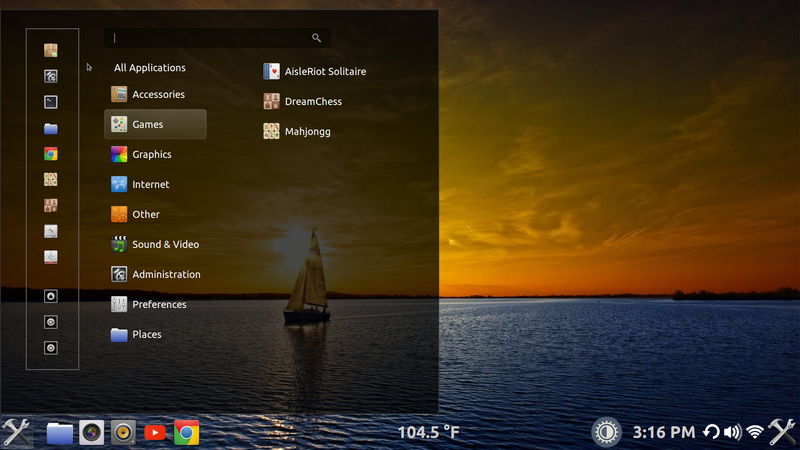 EDIT: Cinnamox has several new themes on 18.5 and some have a semi-transparent Menu Panel. They are well worth the wait as they are executed well. The Cinnamox- Aubergene-Transparent theme is now my favorite theme with Eleganse as a close second. Last edited by Ozo on Sat Feb 24, 2018 8:38 pm, edited 2 times in total. I like the Elaganse Theme`which has a dark menu but with a lot of transparency. I add the transparent panel and get a pleasing effect. It is very easy to read no matter the background although there are some backgrounds that do look a little odd behind the menu. This "readability" is due to the letters being lit up in white virtually eliminating the "hard to read" complaint. The HIGHLIGHT when hovering is white but hard to see until you click on the image twice. The Favorites list has just a simple white frame no color. The nearly useless search bar is black which subdues it nicely. If you look close you will see the entire menu has a thin border. This is a really well thought out and executed theme. This is in normal scale. The one above is double scale (on a 40" monitor). Click twice for best view. Of course I add my own twist. 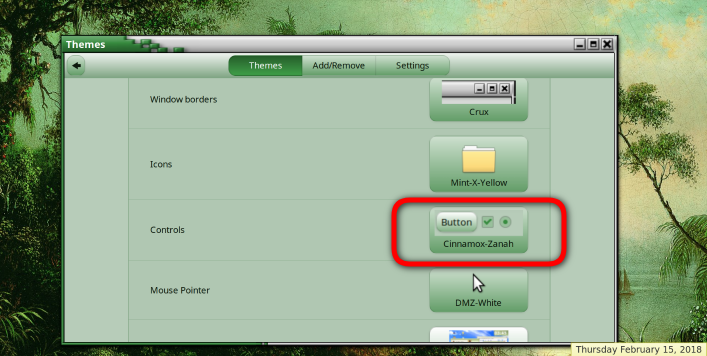 Here is my selection of theme elements from different sources.. All the green on this frame is from the Cinnamox-Willow-Grove "Controls", and the unique metallic border top is from the Cruz Theme (Window Borders). 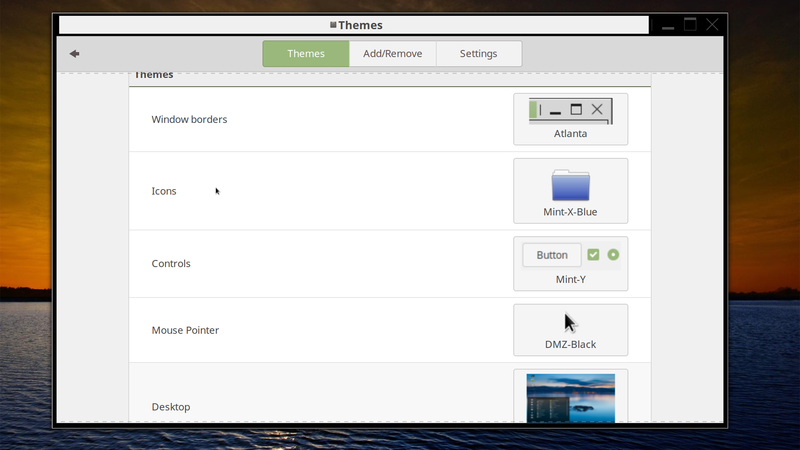 Here is that page (Themes) with the different elements as shown. You can get it in black too. Still the Eleganse theme. This puppy will toast your corneas if screen brightness is high and its in full screen. How cool is this theme! So glad for this thread that lead me to discover the matching icon set for it. Very happy with how my Mint is looking. Kudos to all! I've updated the existing Cinnamox Themes and added 4 more to the family. 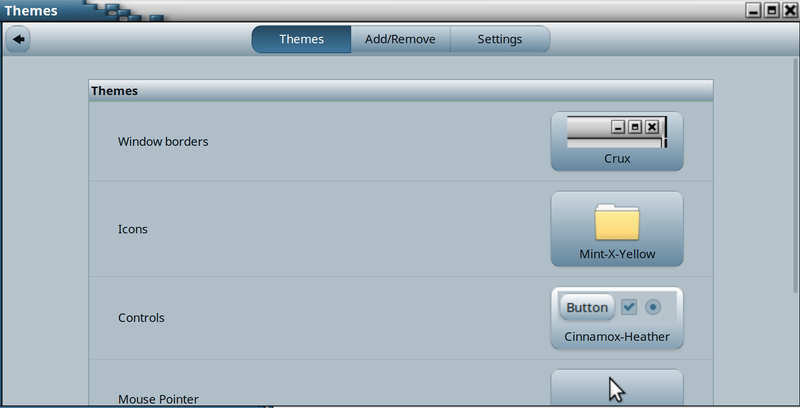 All available in your Themes App or via Cinnamon-Spices. Each theme includes a small interactive bash script that allows end users to adjust the transparency of the Cinnamon Theme. The default is no transparency. Once a theme is installed to access the tool open a terminal window (Ctrl-Alt-T) and use the following command to make the script executable and launch it, replacing <THEMENAME> with the actual theme name. If you are not happy with the end result simply run ~/.themes/<THEMENAME>/cinnamon/cinnamox_transparency.sh again to chose another option including the default. So for example if I wanted to try a transparent version of Aubergine I'd use chmod +x ~/.themes/Cinnamox-Aubergine/cinnamon/cinnamox_transparency.sh && ~/.themes/Cinnamox-Aubergine/cinnamon/cinnamox_transparency.sh for the first run or ~/.themes/Cinnamox-Aubergine/cinnamon/cinnamox_transparency.sh for subsequent runs. Hello steve, this script allows you to set the transparency of Cinnamox-Aubergine. The current transparency of Cinnamox-Aubergine is No transparency. or select 4 and press enter to quit. Now activating Cinnamox-Aubergine - Low transparency. Press enter to exit the script. 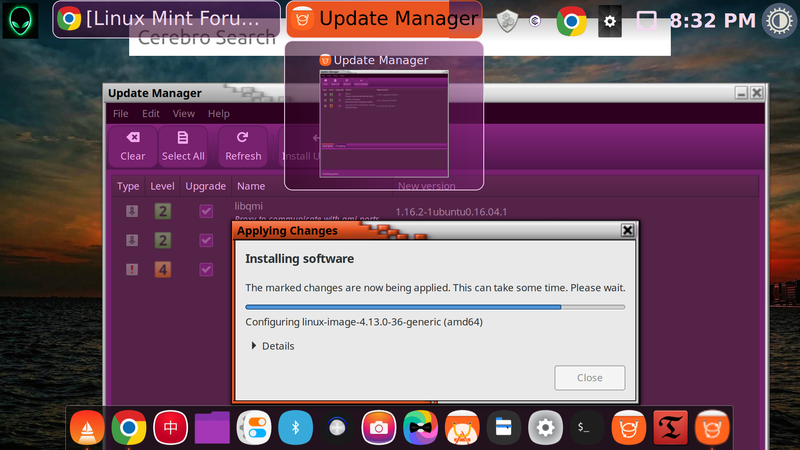 The current transparency of Cinnamox-Aubergine is Low transparency. Now activating Cinnamox-Aubergine - Moderate transparency. The current transparency of Cinnamox-Aubergine is Moderate transparency. Now activating Cinnamox-Aubergine - High transparency. Enjoy - if you like and use them don't forget to give them a star on Cinnamon-Spices. Last edited by smurphos on Sat Mar 03, 2018 7:22 am, edited 1 time in total. 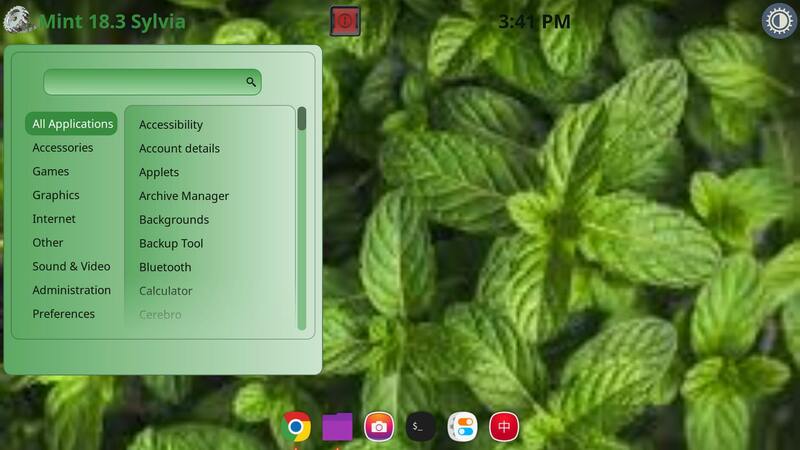 There is an aspect of themes on Mint many do not know about. That is the ability of Buttons themes to provide color to backgrounds. I used Cinnamox-Zanah (green) and Cinnamox-Kashmir (blue) to give these colors which is independent of a theme. 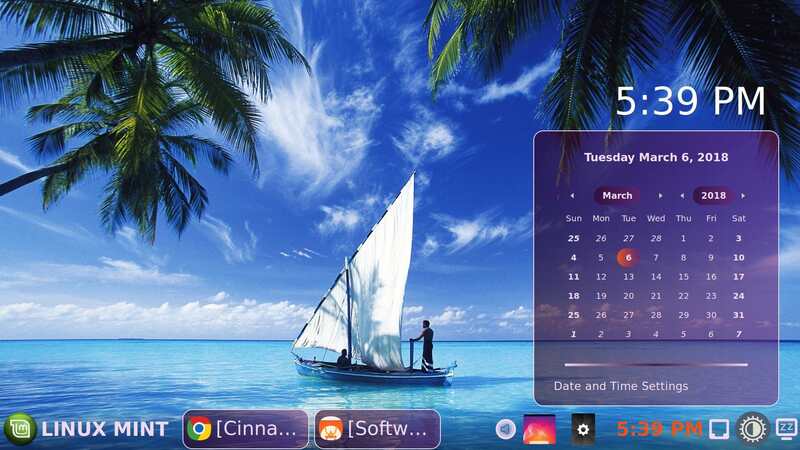 In this case it is not a Cinnamox theme. Oddly the backgrounds are not all the same shade. For those who have read this far, a theme tip. 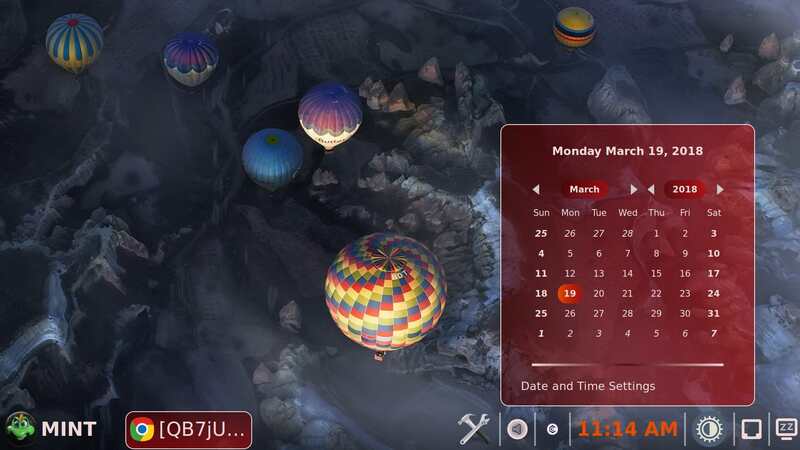 Right click the panel and select themes from the pop up. Click the arrow top left to enter System Settings if you want. I have Themes pinned to my panel because I go there so much right now. Last edited by Ozo on Fri Feb 16, 2018 3:37 pm, edited 2 times in total. Glad you like them Ozo. I was hesitant to try these because I thought they would be a repeat of other colored themes but was pleasantly surprised. 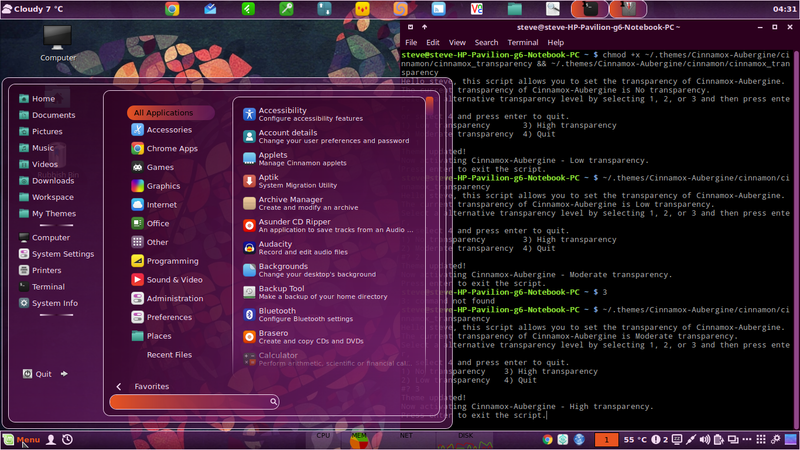 The Aubergine-transparent theme is fun and the colors are not shocking as you might think. After a short time it has become one of my favorite themes. The attention to detail is quite noticeable. I will give all of the new themes an honest look and suggest others to pull yourselves out of that rut and do the same. EDIT; I just loaded Cinnamox-Heather and then copied/pasted the code into the terminal for the transparent version . I do have the Extension Transparent panels installed and the lower panel is truly transparant. Last edited by Ozo on Fri Feb 16, 2018 3:33 pm, edited 4 times in total. 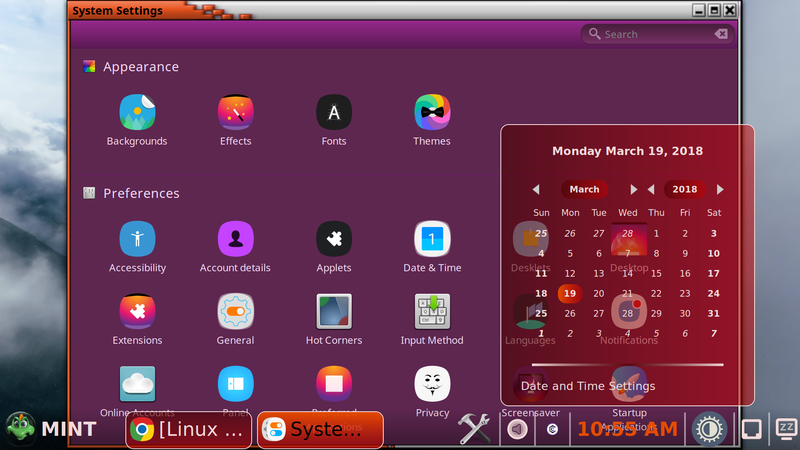 EDIT; I think the calendar in Cinnamox-Aubergine-Transparent is excellent. It is quite transparent as you can see but not totally transparent. That is double scale by the way. The clock is the Clock desklet and without decoration has no background. That is set in General Desklet Settings. One other thing I noticed about this theme is that the panel behavior is excellent. The active items are in boxes and when many are there it is not so confusing. The box backgrounds are very nice with color animation which can not be shown here. Even the pop up boxes on hovering have the same rounded corner frames and nice transparency too. The volume and panel clock are nearly invisible on most backgrounds but on hovering light right up which really cleans up the panel appearance. The menu panel is interesting. It has multiple frames.which makes it look like individual boxes overlaying one another as each has different transparency. Well done. The Theme Master (is that the right title?) has chosen to use orange for highlighting (right term?) which is a creative touch and the button color fades which adds much to the aesthetic appeal. 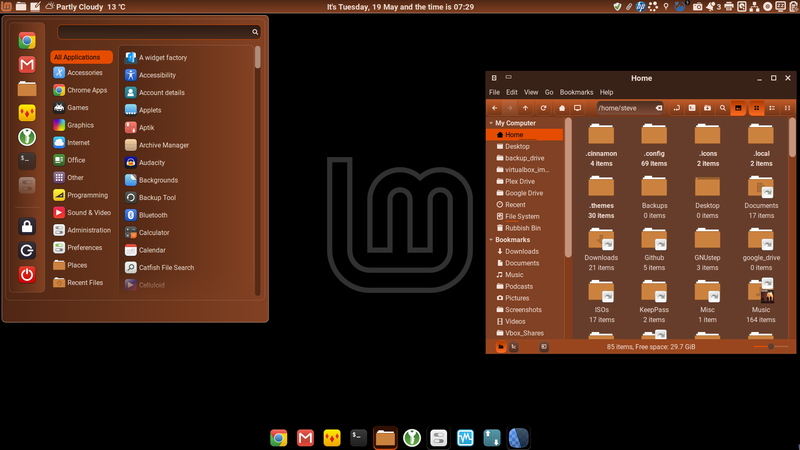 Notice that the Crux Window Borders have the orange from the Cinnamox theme. I have bumped this up to #1 on my list of favorite themes. The dark theme Eleganse has slipped to second. Cinnamox-Aubergine-Transparent is really smooth and pleasing to use day to day. There are many things I like even the small things as in this photos. The orange is highlight when the printer is clicked and is much brighter in real life. 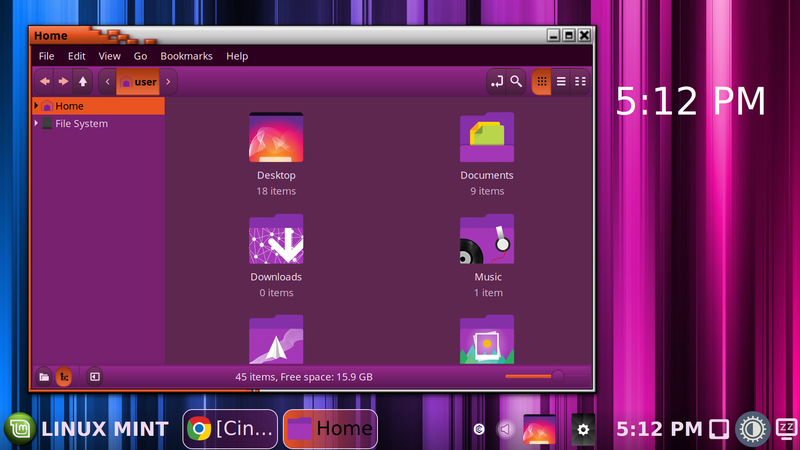 I even found an icon set to compliment Cinnamox-Aubergine. It is Zenlism-Wildfire See photo of my Home file. Notice the matching file icon on the panel too. EDIT: this is the text I used to load it. this is a big download at 200MB+. Last edited by Ozo on Fri Apr 06, 2018 9:41 am, edited 7 times in total. 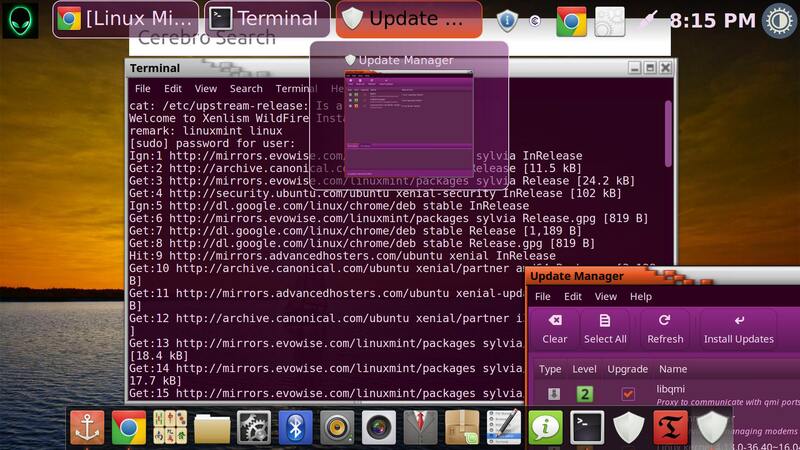 Here I am hard at work with the Cinnamox-Aubergine-Transparent theme keeping things spicy. I am downloading the Xenlism WildFire custom file icons as I need the purple one (SaturDay) to match my theme. I am waiting for the download to finish before I attempt to update. Cerebro search is at the ready. That is Docky keeping things organized at the bottom. Those icons will all change when I get the new Wildfire icons. The now somewhat neglected panel is on top. 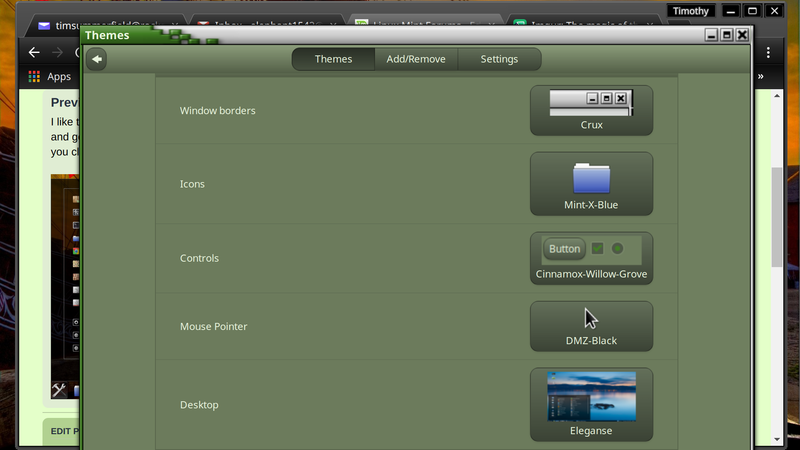 For transparency of the Cinnamox themes I had better luck with the links supplied above for each theme. The text above was uncooperative for me but the link had the text in a format that is easy to copy/paste plus it worked. 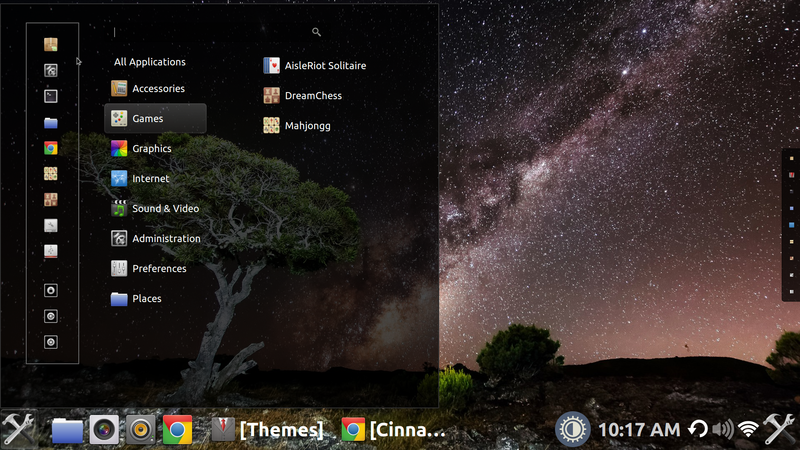 EDIT: Here is a shot of the non-transparent Cinnamox-Zanah theme menu. The menu is a stripped down version. The panel is stripped down too. Last edited by Ozo on Tue May 29, 2018 3:44 pm, edited 2 times in total. At first I thought the Cinnamox-Rosso-Cursa-Transparent theme was too bright but after a while I see it is not. It is a dramatic change but that is a good thing. 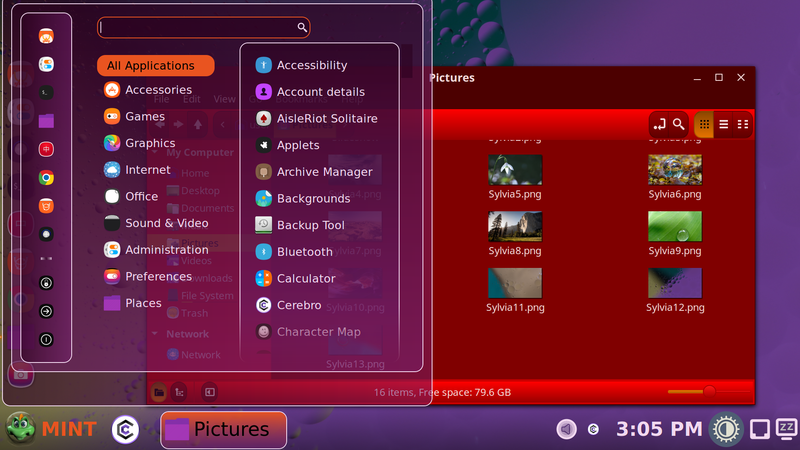 The red menu is with the full theme running but any themes menu is ok and backgrounds will be red with just the Controls option as Cinnamox-Rosso-Cursa (not transparent). Photo #5. 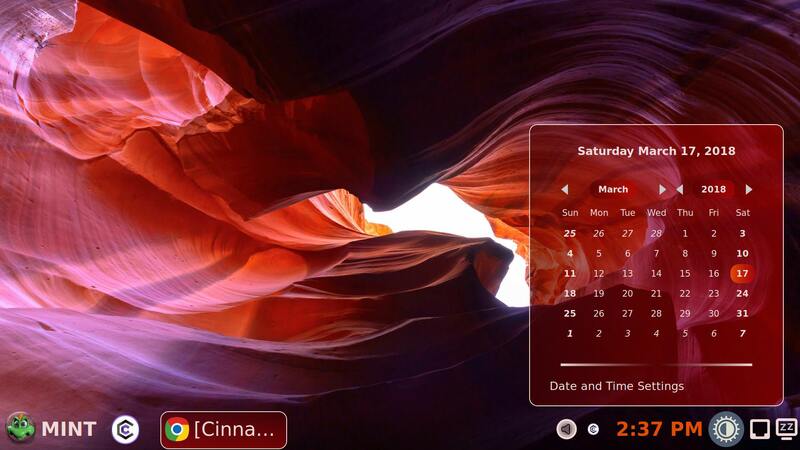 Thats the Cinnamox-Aubergene-Transparent theme with Cinnamox-Rosso-Cursa (Controls theme). The wallpaper is from 18.3 Sylvia's slideshow. 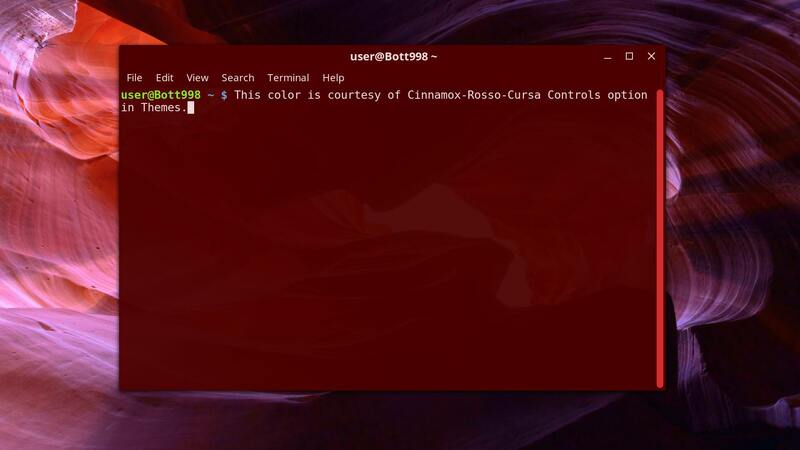 This is a hybrid theme Cinnamox-Aubergene-Transparent, and Cinnamox-Rosso-Cursa (Controls) blend dramatic colors. !8.3 Sllvia slideshow is wallpaper. Here it is the other way around. Nice calendar. Pull the slider or click to view. That cool border with theme color is Crux. This wall paper is from Wallhaven.cc The Cinnamox-Rosso-Cursa-Transparent theme calendar looks good on just about any background. Hello! I only just discovered these downloadable themes and I really dig the Cinnamox-Heather theme! And I appreciate having some control over the transparency, being a less transparency person, I suppose. I got one issue I am finding with the theme though, and hopefully, you, or another, can help me fix it. When I click on an item in my system tray, like the calendar, it has no background and I can barely read the menu items. This is the same for any items on my toolbar, or my recent documents button on the toolbar. Is there any way to correct this, or tweak the settings on it? What level of transparency do you want? The default is none at all which is sounds like is your preference. If you have already run the transparency script once you can run it again using ~/.themes/Cinnamox-Heather/cinnamon/cinnamox_transparency.sh and select another option (including the default - none). If the menu background are virtually gone it sounds like you have it set to transparency high currently. Have you downloaded the theme recently? Heather did have a bug in the transparency script for a while but that was fixed back on 21/3/18. Edit to add - What's your Cinnamon/Mint version? That is simply stunning. Well done. I am using Linux Mint 18 (Sarah) and Cinnamon 3.0.7. I have cycled through all the settings on the script, including none. The script only changes the transparency of the pop up screen when I click on the menu button. But, when I right click on anything on my menu bar (like Chrome if I have it launched), or anything in my system tray to the right, there is still no background, or like high transparency is still unaffected there. 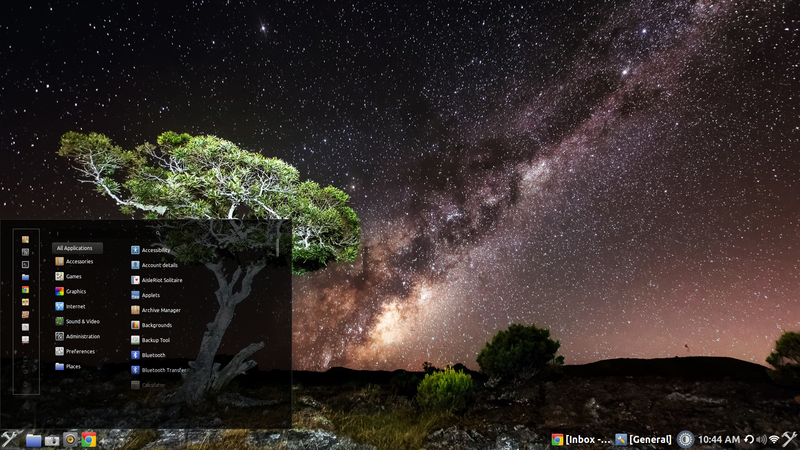 And I have a dark wallpaper, which adds to everything being "invisible" with black text. Hopefully, this is not too small, but I had to move a window over to the corner to show the calendar when I click on it in system tray. The window contrasts the text so you can see it. This is with transparency set to "none". But half the calendar is not visible where the other window is not behind it. 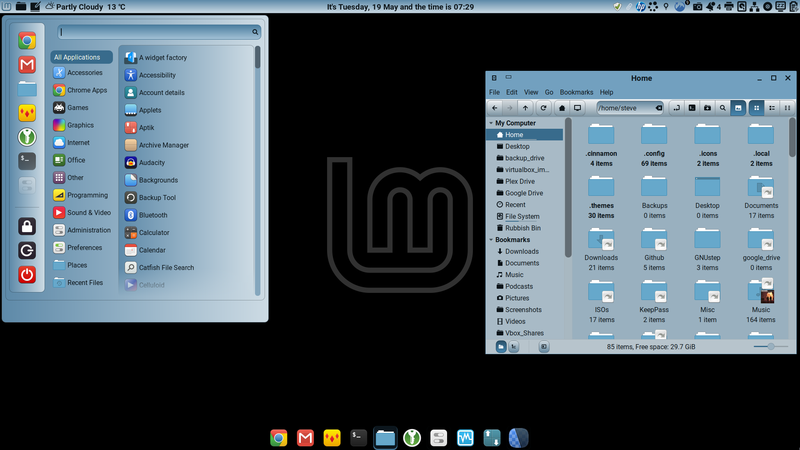 The theme is intended for Cinnamon 3.2 or above introduced with Mint 18.1. I would suggest upgrading to 18.1 or later. Cheers catweazel. Appreciate the feedback. I'll send you an invoice. Ahh, ok, I missed that. I'm a little behind the times still. I appreciate you taking the time to answer. I will live with it for now until I get to upgrading. Still, I love the theme.